A European Space Agency tracking station in Australia was expected to contact Russia's Phobos-Grunt spacecraft at least two times Wednesday, one day after the site heard signals from the stranded probe for the first time in two weeks. The Perth ground station has two opportunities Wednesday to contact Phobos Grunt. The passes begin at 2021 GMT (3:21 p.m. EST) and 2153 GMT (4:53 p.m. EST) and last seven and 10 minutes, respectively. The tracking station heard from Phobos-Grunt on Tuesday, the first time a ground site established contact with the probe since it launched Nov. 8. The Perth station transmitted telecommands provided by NPO Lavochkin, the mission's Russian contractor, according to ESA. Perth's 49-foot dish was modified with a feedhorn antenna to transmit low-power signals over a wide swath of the sky. Engineers adjusted the signal strength because Phobos-Grunt's receiver was designed for low-power communications in deep space. Phobos-Grunt is orbiting less than 200 miles above Earth, so conventional deep space communications antennas generate very powerful signals so close to Earth. In a press release Wednesday, ESA said Perth was ideally positioned because Phobos-Grunt was in sunlight so its solar panels could produce electricity. Controllers are not sure if the craft's batteries are charging on the night side of its orbit. 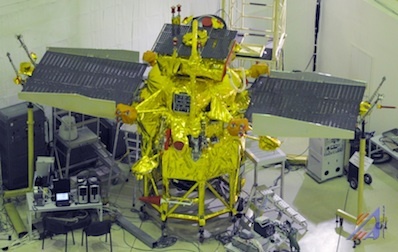 "Owing to its very low altitude, it was expected that our station would only have Phobos-Grunt in view for six to ten minutes during each orbit, and the fast overhead pass introduced large variations in the signal frequency," said Wolfgang Hell, the Phobos-Grunt service manager at the European Space Operations Center in Darmstadt, Germany. The Perth station commanded Phobos-Grunt's transmitter to switch on, and the ground receiver heard a signal from the probe. European officials sent data to Russian mission controllers for analysis, according to ESA. The 29,000-pound, truck-sized probe launched Nov. 8 on a Zenit rocket. After reaching low Earth orbit, the craft was supposed to fire twice to push itself out of Earth's gravity and on a course to Mars. Neither engine firing occurred, and efforts to diagnose and resolve the problem repeatedly failed. Officials were not able to receive telemetry from the spacecraft. The $165 million mission was designed to land on Phobos, the largest moon of Mars, and return rock samples to Earth in 2014.